** Photo to come soon! Perfect for those who have the perfect shelf material already, and don't want to use traditional brackets. These are intended for heavier shelves and come with backplate heights of 2", 4" and 6" - please choose the height of the backing plate based on your shelf thickness -or- intended weight load - the bigger the backing plate, the more robust it'll be. 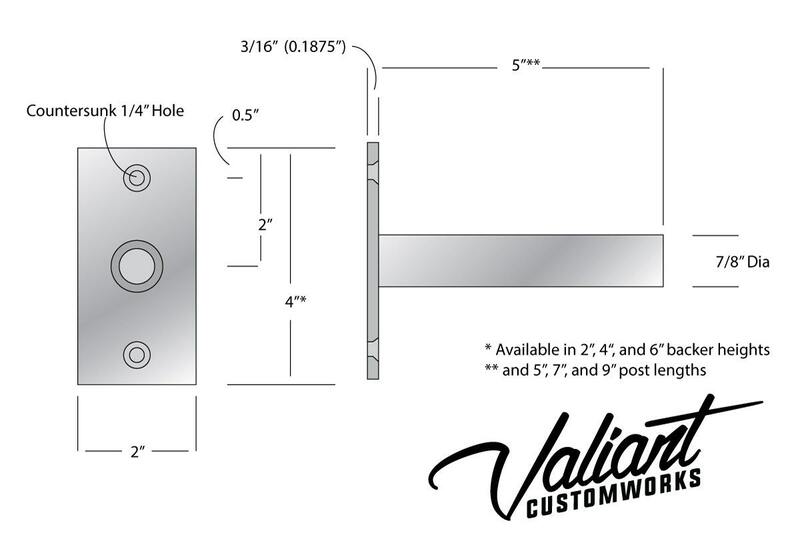 Backing plates measure 2" wide by 3/16" thick by your selected height - holes are drilled 1/2" from the ends on centre - 13/64" screw hole with 3/8" countersink. These brackets are intended for heavier installs compared to our regular 1/2" post design - if you have any questions, please feel free to ask - however, as these are DIY products, we can't guarantee their performance. **Improperly installed brackets will have a very low weight capacity before mounting failure. Simply recess the back side of the shelf for the bracket, and drill a 7/8" hole with a commonly available drill bit, bolt the brackets up and slide the shelf on. Alternately, you could install the brackets in plate before drywall/plaster application for a completely seamless look - be sure to calculate your length taking the thickness of the drywall into account. Once the shelf is installed, you should anchor the shelf to the wall or to the post with a locking screw. If you have any questions, please don't hesitate to message! As with any other hidden/floating shelf bracket - they aren't intended to carry huge amounts of weight, but, they are definitely tougher then your generic thin-wall stuff available at your local flat-pack furniture store. They come unfinished. Pricing is PER PIECE. Very well made brackets that are holding up a large redwood record player shelf with only one bracket mounted in a stud. Excellent communication, amazingly fast delivery.